Derry City manager Kenny Shiels will have been frustrated by his side's scoreless draw at United Park. DERRY CITY produced a lack-lustre display against a well organised Drogheda United side in what was a terrible encounter at United Park. Although having a lot of possession the visitors never really threatened Pete Mahon's out-fit and but for some crucial saves by Gerard Doherty, the visitors could have went home without a share of the spoils. Kenny Shiels made one change from the side which drew at Dundalk in mid-week with Mikhail Kennedy getting just his fourth start in a Candy Stripes jersey, replacing Nathan Boyle, who dropped to the bench. As for the home side they were forced into one change themselves with ex-City midfielder Killian Brennan missing out with a knee problem and Jake Hyland came in to replace him, but in the warm-up right-back Colm Deasy picked up an injury and he had to be replaced by Conor Kane. At a sun soaked United Park it was the home side who should have taken the lead on seven minutes as Adam Wixted charged down Aaron Barry's clearance before feeding an unmarked Sean Brennan, but the midfielder somehow fired wide from close range. United suffered another injury set-back on 18 minutes when goalkeeper Stephen McGuinness had to be replaced following a lengthy stoppage after he fell awkwardly when collecting a corner; Ryan Coulter was the man who went between the sticks. 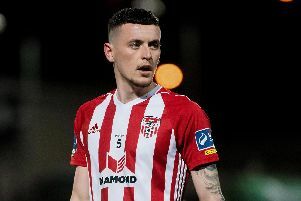 Derry's first effort on target came in stoppage time in the first half, but Ronan Curtis' strike from the left hand edge of the box, was easily gathered by a diving Coulter. A very disappointing opening 45 minutes, saw City's talented midfield trio of NIcky Low, Aaron McEneff and Barry McNamee all struggle to get into the game. On 56 minutes City old-boy Mark Griffin would have broken the deadlock but for Conor McDermott's timely block, as the striker's shot on the turn from 10 yards was charged down by the Northern Ireland U21 international. Virtually straight away Griffin got in behind again, but this time Doherty saved with his feet. City themselves had half a chance a minute later when Lukas Schubert broke the offside trap, but after rounding the out-rushing Coulter, the Austrian was forced well wide and the chance was gone. Just after the hour mark Derry made a double substitution with Joshua Daniels and Boyle replacing Curtis and Schubert, as Shiels tried to spark some life into his team. The visitors should have gone in front on 69 minutes, as Kennedy superbly created himself some space to get into the Drogs penalty box, but his well hit drive was kept out by Coulter. Derry made their final change on 79 minutes as teenager Rory Holden came on for the disappointing McNamee. Doherty was called into action on 88 minutes this time Drogs' Jake Hyland saw his snap-shot parried away for a corner. In stoppage time substitute Holden had a super chance to steal the points, but he headed wide from eight yards after Low's clever cross had picked out the Gobnascale man. Drogheda United: McGuinness (Coulter 18), Kane, Farragher, Gallagher, Dunne; Hyland; Byrne (G Brennan 74), McEvoy, S Brennan (Thornton 74), Wixted; Griffin. Derry City: Doherty, Monaghan, McDermott, Barry, Jarvis; McEneff, Low; Curtis (Daniels 65), McNamee (Holden 79), Schubert (Boyle 65); Kennedy. Referee: Mr Rob Rogers (Dublin).